Woolly Two Shoes: It's On Sale, Silly! Just taking a short break from normal programming to spread some exciting news - a whole bunch of UK Etsy shops (including me!) 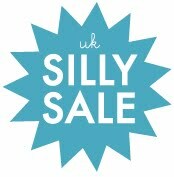 are taking part in a Silly Sale at the moment. Lots of fantastic items are on offer right now, and most sales end on Saturday or Sunday, so if you really want something, please pop over to Etsy right now, or have a look here. P.S. Big thanks to superduper Louloudo for making up that handy silly sale badge! Click here for her blog or scoot over to her Etsy shop for some incredible £5 bargains!